Otenba Becky no Daibouken is an action platforming game for the MSX. 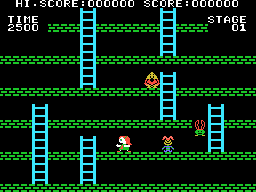 Otenba Becky no Daibouken is a small Lode Runner clone for the MSX1 home computer. The only Japanese text is the instructions on the title screen, this patch translates it to English if the game is ran on a non-Asian BIOS.